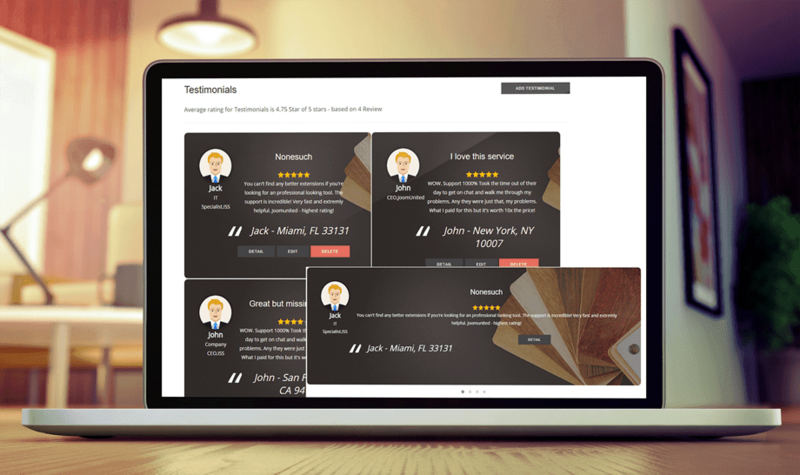 My Testimonials is a Joomla extensions that allows you to get clients testimonials and display them the way you want. It's fully integrated with Google Rich Snippet. My Testimonials allows you to create testimonials from Joomla backend and from frontend (next chapter). From backend, you can use the default category or create new ones. Nested categories are allowed. You can get testimonials from your users on frontend. From the settings you can activate this feature. The setting comes with some additional restriction configuration. Depending of the permission, some buttons will be displayed on frontend. The testimonials can be displayed using menus, module and you can setup your own design. From the menu you can display a single testimonial, a testimonial list or a geolocation based testimonials. You can setup the testimonial category to display on frontend. Finally, in the Testimonial Options tab you can activate the rich snippet output (to display ratings in Google search results), the column count and display/hide the testimonial details view. The frontend rendering will be a testimonial masonry wall, respecting the number of columns you've chosen. The testimonial module allows to use the Joomla module display flexibility to display a testimonial list masonry wall (like the menu) as slideshow. First, select a category of testimonial and a listing type. Testimonials details view: Display/hide the testimonial detail view. Direction: Sort order. Descending is highest to lowest. Ascending is lowest to highest. From the component setting, you can select 2 predefined layouts, Vertical or Horizontal. And you got a preview of the design from the admin on save. About the avatar, there's an automatic image resize on upload (to avoid heavy images loaded on hundred of testimonials) and you can setup the avatar sizes and the crop method. The second tab of the configuration is about the Google Company Rich Snippet. The component allows you to get testimonials, if your website is about a company, a brand... you can setup the company information from there. All those information, along with testimonials, will then be displayed on Google search results and also on Google Maps. My Testimonial is integrated with YouTube, it means that's once activated from the settings, you can add a YouTube video link related to a testimonial. It could be a video testimonial for example. The Google Maps integration allows you to locate all your testimonials and then display a global map with all testimonials locations.